This new version now has all 5 pins broken out on the connector. We have no idea what USB device you are hooking up to, but if you need to add a miniUSB/USB miniB connector to your breadboard - here it is. This new version now has all 5 pins broken out on the connector. 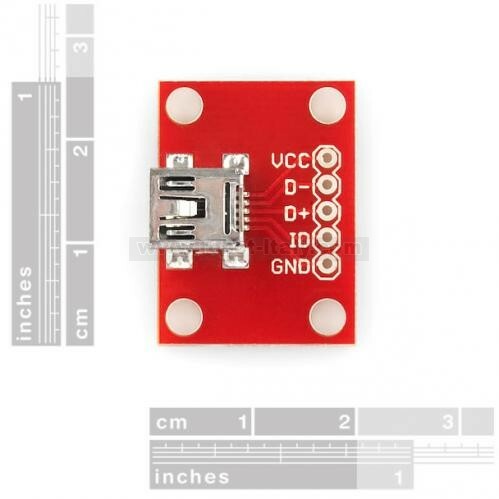 We have no idea what USB device you are hooking up to, but if you need to add a miniUSB/USB miniB connector to your breadboard - here it is. Also good for an un-regulated, non-limited 5V supply up to 100mA. 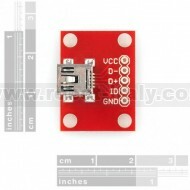 This simple board breaks out a female USB type A connector's VCC, GND, D- and D+ pins to a 0.1" pitch header.